Uses 3" slow dissolving chlorine tablets or sticks. Dial control valve lets you control and adjust the rate of feed. The Hayward CL100 In-Line Chlorinator is a durable, corrosion-proof automatic swimming pool chlorinator. The Hayward automatic chlorinators use large or small Tri-Chlor slow dissolving tablets or sticks - enough to supply three weeks of chlorine sanitation for a large pools and longer for smaller pools. Ideal for new or existing pools or spas and works automatically with your pump and filter system. Saves time, and reduces manual handling of chemicals. The dial control valve lets you control and adjust the rate of feed. In-line chlorinators go in-line near pool equipment to provide a steady amount of chlorine to sanitize the pool. 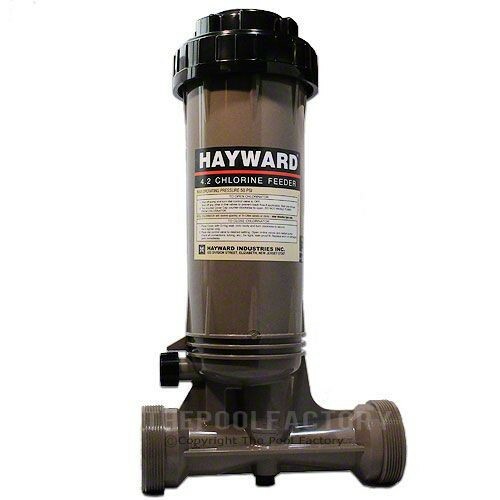 This Hayward Chlorinator is for use with 1" or 3" chlorine tablets or sticks. For over 80-years, Hayward has been helping pool owners enjoy the pleasures of pool ownership by manufacturing cutting edge, technologically advanced pool equipment worldwide. Hayward strive's to ensure that your Totally Hayward System operates at maximum efficiency all season long. Hayward's goal is that at the end of the day, your only concern is to turn your equipment on and off. Hayward provides the latest in pool pumps, filters, heaters, cleaners, controls, lighting, and salt chlorination.